A layer cake is always a lovely dessert to put out at the end of a meal, whether you’re celebrating a special occasion or just a love of desserts. There are plenty of times when you don’t need a full size layer cake – and those times tend to be when you’re serving a small gathering instead of a large crowd. A gigantic layer cake might be a showstopper, but a good portion of it might end up going to waste if you simply don’t have enough people around to eat it all! 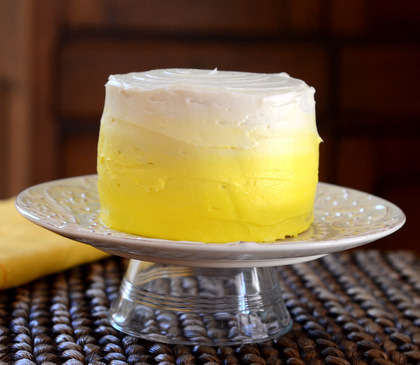 This Mini Lemon Layer Cake is one of my favorite desserts when I want to serve something with a little bit of flash, but only have to serve a small number of people. The cake layers are baked in 4-inch springform pans – you could use traditional pans, not springform, if you have them – and are stacked four layers high into a relatively small, yet substantial, cake. 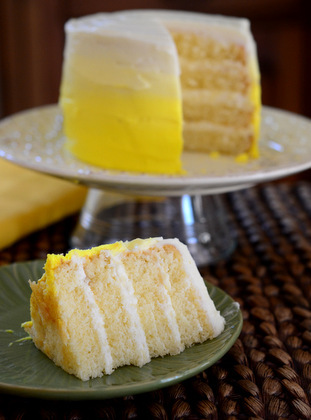 The cake is flavored with vanilla and fresh lemon zest so it has a bright citrus flavor that is good at just about any time of the year. As you are making the frosting, you can either go with plain vanilla to tone down the citrus or add some lemon extract into the mix to amplify it if you are a lemon-lover. The cake is fluffy, tender and not too sweet, so it balances nicely with the layers of frosting that hold the whole thing together. I make a generous amount of frosting to ensure that I have enough to coat the cake evenly and have a little bit left to play with decorations. The cake is taller than it is wide and will serve 4 to 6 people. It may look small at first glance, but there is as much cake (and frosting!) in here as there is a full size 8-inch cake! The cake layers can be prepared a day in advance and frosted on the day you intend to serve the cake, but the small cake layers bake and cool very quickly, so assembling this dessert takes a lot less time than it would if it was scaled up in size by a few inches. Preheat oven to 350F. Lightly grease four 4-inch mini springform pans. In a large bowl, or the bowl of a stand mixer, beat eggs and sugar together at medium-high speed until the mixture has at least tripled in volume, about 5 minutes. Beat in lemon zest. Whisk in flour mixture by hand or with the mixer at low speed. In the meantime, combine butter and milk in a small saucepan and bring to a simmer, stirring to melt the butter. Remove from heat and add in vanilla and almond extracts. Allow to cool slightly, 1-2 minutes. With the mixer on low speed, gradually incorporate the hot milk mixture into the cake batter until batter is uniform. Divide evenly into prepared pans. Bake for about 15-17 minutes, or until the cake springs back when lightly pressed and a toothpick inserted into the center of the cake comes out clean. Allow cakes to cool for about 5 minutes in the pans, then run a knife around the edges and turn them out onto wire racks to cool completely. When cakes have cooled, place one on a cake stand or serving platter. 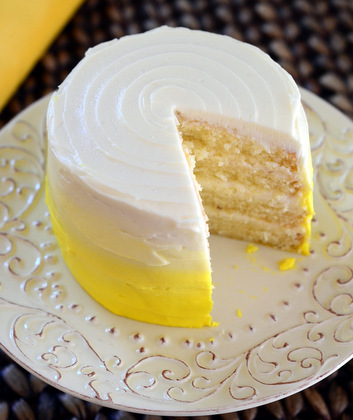 Top with a generous dollop of Lemon Buttercream Frosting (recipe below) and spread it into an even layer. Top layer of frosting with another layer of cake. Repeat the process until all four layers of cake have been stacked. Spread a thin layer of frosting over the whole cake to create a crumb coat, then refrigerate the cake for 10-15 minutes. When the thin layer of frosting is set, spread a thicker layer of frosting over the top and sides of the cake using an offset spatula. In a large bowl, beat the butter until softened. Blend in half of the confectioners sugar, along with the milk, vanilla and lemon extracts (and zest, if using). Gradually blend in the remaining confectioner’s sugar until frosting is thick, firm and smooth. Spread onto cooled cake layers as needed. What a beauty. I find it hard to resist moist-looking lemon cakes like this one. Thanks for the recipe. Love the ombre frosting on this. You’ve also justified my desire to buy mini springform pans. I will have more uses than just making small cheesecakes! 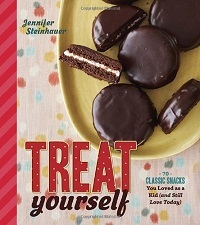 they all look so good these recipes,might try a couple or two. Baked this for a small Birthday luncheon. I used 2 six-inch pans and increased the bake time a bit. I’ve recently been diagnosed with wheat/gluten intolerance, so this was my first experiment using a conventional recipe substituting GF flour (Krusteaz Gluten-free AP Flour). It was a success! Moist and flavorful. The crumb may have been a bit denser than the original version, but, hey, it allowed me to enjoy a slice of actual Birthday cake! The other guests enjoyed it and said they wouldn’t have known it was GF.